My favorite way to grow climbing beans is on a teepee, that is, on four poles stuck in the ground and lashed together at the top. Each summer I have 2 or 3 growing in my front yard. But I've had a fantasy of making a big one someday, big enough for a couple of kids (and me!) to crawl inside. So recently, when I designed my friend Margie's gardens for her new home I included bean teepee for her son, my bean-buddy Alexander . If you do a web search for bean teepees you can find a lot of versions on how to build one. Here's one I liked on YouTube made by Sustainable Midlands and City Roots. Use 6 very long bamboo poles; I'm estimating about 12 - 15 feet high, such that when you lean them together the space at the base of the teepee will be about 6 feet, or enough room for kids to sit inside. Space the poles apart evenly, but leave enough room between two of them for the entry, or "door". Set the poles about 4 inches into the soil so that they are sturdy. Lash the poles together with twine at the top. Prepare the base (floor) of the teepee by laying down sheets of cardboard in about 3 layers to suppress weeds and to form a level base. Cover the cardboard with 3- 4 inches of minbark or clean straw (not hay- it has weed seeds) to make a comfy seating area. Take the twine and wind a few strands between the poles (see video) so that the beans will climb on them for support and eventually cover the sides of the teepee, but leave the door open and free of twine for easy entry (they forgot this part in the video). Plant beans seeds along the outer edge of the teepee's sides, except the entry. Plant the beans about 1/2 inch deep, 4 inches apart in soil that you've prepared with some mature compost mixed with a small amount of organic vegetable fertilizer. Beans don't need a lot of fertilization, but they do appreciate nice loose soil with organic matter in order to grow strong roots. Water the planted seeds and keep the soil evenly moist while they germinate (about 7 to 10 days). Note: beans like warm weather, so they won't germinate (sprout) unless the nighttime temperatures are staying in the mid-fifty degrees (F) at least, and the soil has had a chance to warm up. Now for the really fun part, choosing which beans to grow. Since I have lots of favorite beans, I have to chime in. 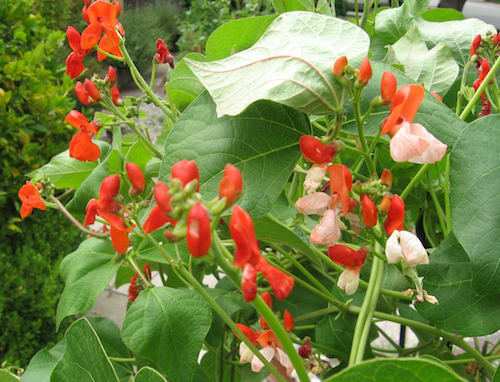 You can't go wrong with runner beans (P. coccineus), such as Scarlet Runner or the lovely Painted Lady bean, both of which have showy flowers. 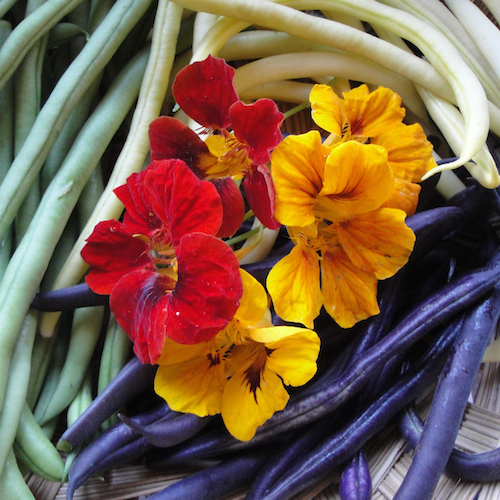 You can eat them at any stage: flowers, pods, fresh shell beans and dry beans. A huge bonus is that in mild winter climates as we have here in the San Francisco Bay Area, runner beans die back with frost but will reemerge in spring, unlike like so called "common beans" (P. vugaris- pintos, black beans, cranberry, etc. see my post for more). 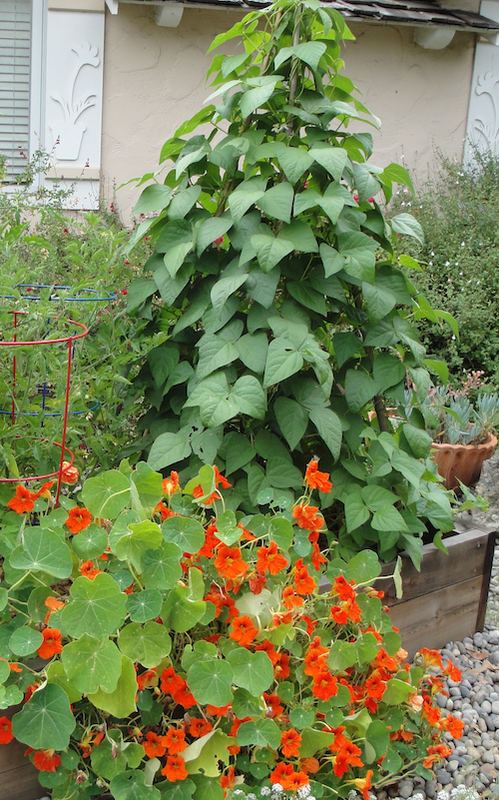 Scarlet Runner and Painted Lady beans - ornamental and edible! My top pick for kids would be to grow some snap beans (aka: green beans, or string beans), and my hands-down-must-have snap bean is Emerite, an old French variety with pencil-thin tender beans that produce over several weeks. I discovered these through Rene's Garden, an heirloom and gourmet seed supplier, and I grow them every summer. You can also order a tricolor bean seed packet from Rene's that has yellow, green and purple beans for extra fun. Make sure you get pole beans and not the bush type! Beans don't need to be pollinated to produce pods, but bees sure like bean flowers anyway. 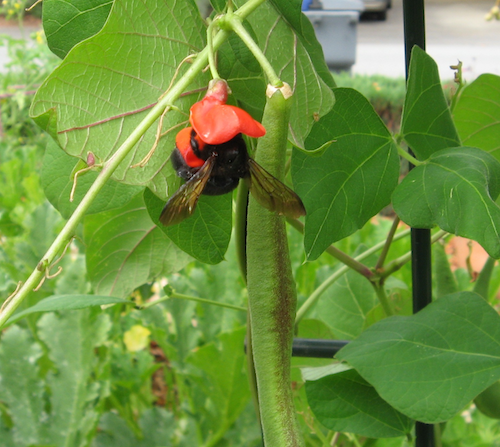 In my garden it's mostly large but docile carpenter bees that visit my beans. If you have bees in your garden and you're worried about kids getting stung by accident, then a bean teepee may not be a good idea. Or you might try fastening a barrier of cloth on the inside of the teepee up to about 4 feet or so. You'll have to decide if it's risky or not. Acrobatic Carpenter bees love bean flowers!